Season the meat on both sides and seal in a hot pan with a splash of olive oil until browned all over. Lower the heat and cook for a further 3 to 4 minutes and then allow the lamb to rest for the same amount of time. Chop the shallot and garlic finely, sweat in butter in a heavy bottomed pan. Peel and dice the carrot and add to the shallots with the cumin seed, when the mixture start to turn golden add the water and a little cream, cook until the carrots are completely soft and then blend to a fine puree. Pass through a fine sieve and add extra cream to adjust the consistency if needed. Peel the salsify and place in water with a squeeze of lemon juice to stop them discolouring. Cut the salsify into 2 cm long diamond shapes and gently simmer in salted water tender. Drain and toss in butter and season with salt and pepper. Pick the parsley and plunge into boiling water for 1 minute. Immediately place in ice water to retain the colour. Add to the oil, season and blend till you have bright green fragrant oil. Pass through muslin to remove the pureed parsley. 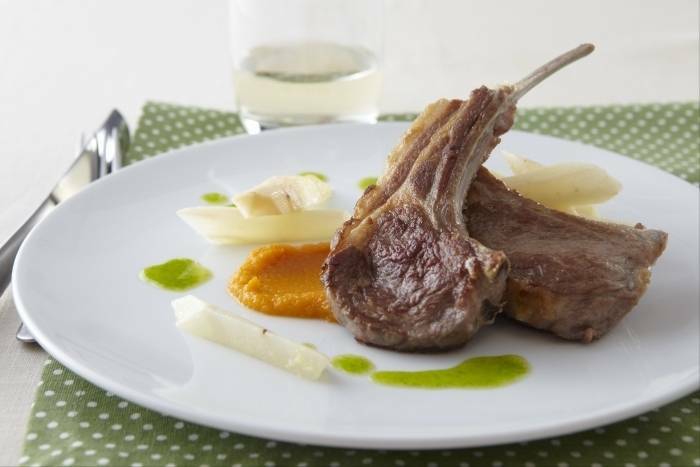 Swipe a tear drop of carrot puree across the plate and place the lamb chops with the bones upright. Neatly place the salsify close to the lamb and drizzle with the parsley oil to finish.